Just looking at this is making us cold. It’s bitterly cold in Pyeongchang right now, but that didn’t stop Team Bermuda from wearing shorts to the Olympics opening ceremony today! The members of Team Bermuda braved the sub-freezing temperatures in red shorts, blazers and without hats — and Twitter is both impressed and concerned. Pretty much all of the other athletes bundled up in heavy-duty winter gear. Team USA even wore heated parkas and jackets — so Team Bermuda must be seriously committed to their laid-back beach vibe. Team USA enters stadium: winter jackets + giant heated gloves. Team Bermuda enters next: short shorts. 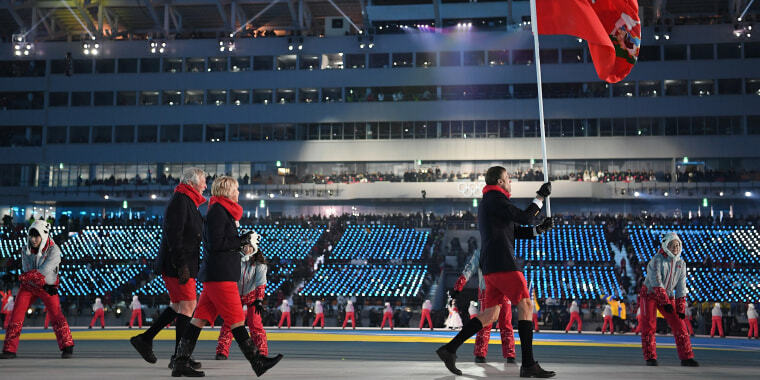 Of course, the team always wears red shorts to Olympics opening ceremonies, regardless of weather. After all, when it comes to clothing, what could be a more iconic symbol of their country than Bermuda shorts? Still, it’s pretty amazing that they won’t even make an exception in 25-degree weather. But maybe the athlete we should really be concerned about is Pita Taufatofua, the Tongan flag bearer, who went bare chested and didn't even look that worried about it. At least Team Bermuda had gloves and scarves! We have to have respect for a team that doesn't let weather get in the way of a longtime tradition (as crazy as it may be! ), but just looking at these photos is making us cold. Let's hope they get some pants soon!